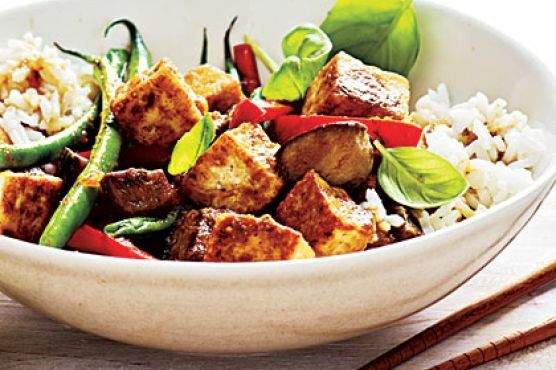 Place tofu on several layers of paper towels, and cover with additional paper towels. Let stand for 5 minutes, pressing down once. Add 1 tablespoon oil to pan; swirl to coat. Add tofu; saut 4 minutes or until lightly browned, stirring occasionally. Remove from pan; keep warm. Wipe pan clean with a paper towel. Return pan to medium-high heat. Add remaining 1 tablespoon oil; swirl to coat. Add haricots verts, eggplant, and bell pepper; saut 3 minutes, stirring occasionally. Add curry paste; cook 30 seconds, stirring frequently. Add broth, soy sauce, sugar, and rind; cook 5 minutes, stirring occasionally. Add reserved tofu; cook 1 minute. Place 1/2 cup rice in each of 4 shallow bowls. Top each with about 1 1/2 cups tofu mixture and 1/4 cup basil. Gruener Veltliner, Riesling, and Sparkling rosé are great choices for Curry. The best wine for Indian food will depending on the dish, of course, but these picks can be served chilled and have some sweetness to complement the spiciness and complex flavors of a wide variety of traditional dishes.